Prospective home buyers who prefer communities off the beaten path are likely to veer towards Vilano. Characteristic of Sarasota bedroom communities, this development is tucked in a cozy, interior suburban location which could be easily missed in cursory searches of Sarasota homes for sale. Flanked by several other neighborhoods, Vilano is located east of Palmer Boulevard and Bee Ridge Road. Its residential sites were developed from the 170-acre, 18-hole links of the Sarasota Golf Club which was closed in 2013 after more than six decades of operations. This community is a development under the banner of Emerald Homes, the luxury brand of national builder D.R. Horton. With its first phase almost sold out, Vilano opened its second phase in the fourth quarter of 2017. The original fairways of the Sarasota Golf Club served as a perfect template for the Vilano community, with many of the mature trees throughout the former golf course meticulously preserved. Dominant among these were the masts of large tropical palms which tower in the easternmost part of the property. As attractive to prospective buyers of Vilano homes for sale, all the water features on the former golf links were retained to provide scenic pond and lake views for most of the residences. 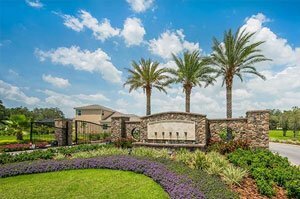 This community further exudes charm in its attractively landscaped entrance featuring a stonework gate and a welcoming bridge in a pond with a large water fountain. Because of the well-preserved and enhanced natural environment in the property, its greenbelt and water features of the former links remain as a habitat for endearing wildlife. Celery Fields, a nature preserve located nearby, attracts flocks of migratory birds too that visit Vilano frequently as well. Generous platting went into the 126 Vilano home sites which measure a minimum of one acre. The more spacious lots are between 2.5 and 5.5 acres in size. Emerald Homes set one- and two-story designs in this community, residences that flaunt Spanish Mediterranean style with paver driveways and barrel tile roofing. The homes’ exteriors are either in stucco finish or stone work. Vilano homes for sale come in layouts of between 2,500 and 4,400 square feet designed with three to five bedrooms, with some choice residences featuring private swimming pools. Pricing in this community starts from the high $400s and tops in the $700s range. 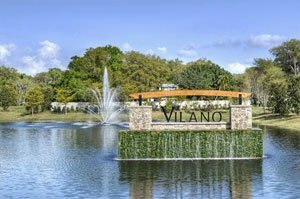 Vilano homeowners pay no CDD fees, and the community’s monthly $240 HOA fees covers maintenance of the community’s private interior roads, irrigation, and lakes. 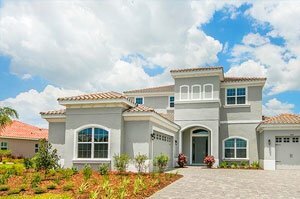 Vilano has a wide appeal amongst potential home buyers, as its features and character are a match for professionals and business executives, as well as empty-nesters and families with children. For the latter, one advantage is Vilano’s proximity to schools of the local district including Tatum Ridge Elementary, Sarasota High, and McIntosh Middle. Even as Vilano provides a quiet, suburban location, its residents can conveniently access all the amenities which have made Sarasota homes for sale stand out on the market. Points of interest near this community include four championship golf courses, one of which is the course of the Laurel Oak Country Club just south of Vilano. Interstate 75, which is only about a mile west of the community, opens easy access northwards to the Mall at University Town Center and the shops and restaurants at Lakewood Ranch Main Street. Other road corridors flanking Vilano also enable its residents to easily take trips to downtown Sarasota and the Gulf Coast beaches that are but some 20 minutes away from this amazing D.R. Horton community. Below are the current real estate listings available at Vilano.